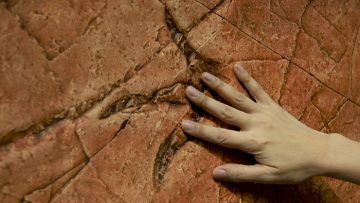 Come by the Beaty Biodiversity Museum for a special evening with the Peace Region Palaeontology Research Centre (PRPRC) and learn more about the Dinosaur Trackway casts recently added to the museum’s permanent collection. The PRPRC’s Museum Director & Curator of Palaeontology Richard McCrea and Curator & Collections Manager Lisa Buckley will be presenting on Tracking Dinosaurs in British Columbia: The Six Peaks Dinosaur Track Site. You will learn about the work being done at the Six Peaks Track Site near Hudson’s Hope, BC, the long history of dinosaur track work in our province, the biodiversity of dinosaurs from the Early Cretaceous period (115 million years ago), as well as some scientific surprises! The museum will be open with admission by donation starting at 5:00 pm with the presentation starting at 6:00 pm. Stick around after the talk for a guided museum tour.